OUR HOMESPUN, DIY EVERYTHING, SUPER TEENY BUDGET, LOVE AND LAUGHTER FILLED WEDDING REPORT! Dan and I met just over ten years ago in 2000, I say met I actually spied him from my school bus, he went to the rival school in the town(the posh one)except he didn't look like the rest of the school kids in the posh blazers and shiny soes, he looked like a teenage grunge band member, and I was smitten. Word got a round that he liked me and we passed messages back and forth through mutual friends on the school bus. Within a couple of weeks we were together and completley inseparable. The first time I met his parents he introduced me as his future wife and the first time my dad saw him he said 'your not going to marry him are you'. Possibly didn't help that it was on a non school uniform day and dan was dressed like a kurt cobain reject. By 2003 I was eighteen and Dan was twenty, we were living in a rented flat in lincoln, it was here that Dan proposed. I had no idea this was coming, we had booked our holiday to New York for that christmas in two weeks time and that was all I was thinking about. me....why are you being weird? I finally take my eyes away from the tv and look down at dan holding my beautiful sparkling ring with a huge grin across his face, and I think I stopped breathing. Ridiculously happy and smiling like an idiot I of course exepted his proposal. He had planned to do it New York while we were there but was too scared of loosing the ring or me seeing it, so there it was in our crummy little flat watching tele and I couldn't of been any happier. The next few years were amazing we had no wedding plans but were just getting on with life happy to be engaged but that was all. In 2008 I gave up my full time job to go back to uni and study for my degree, I loved my job a lot and becoming a student and giving up regular pay was a huge adjustment. Late that year our landlord had nearly doubled our rent and we knew we would have to move in a wirlwind of three weeks Dan had bought our first home. A month later we were at a relatives wedding and on the way home dan said are wever going to get married? we had been together nine years but had been so busy growing up and having fun that we just never really felt the need to. Yeh ok then was my answer, next year for our ten year anniversary we will do it! Like a lot of people I know I had never actually imagined my wedding day and had zero clue about where to start. I went to the supermarket and bout five wedding magazines, talk about pricey. After two hours of flicking through the magazines the thought of a wedding scared the life out of me. My brain hurt from the hundred parts of the day I would have to think about and organise. 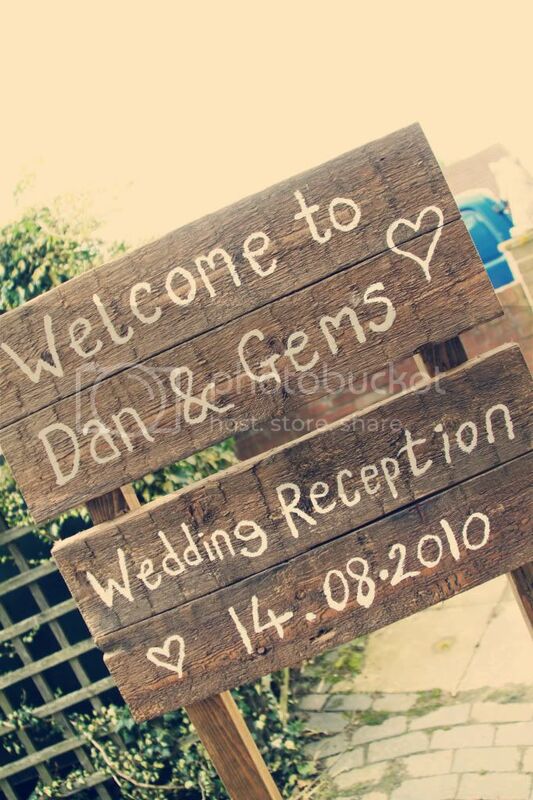 Then I came across the budget section and read the words 'the average uk wedding costs twenty two thousand pounds' great we can't do it I told Dan we'll never have that money, Dan said that not all weddings have to cost that much! how did he know this he's a boy. Well he was right after a quick google search I stumbled across, style me pretty and rock n roll bride and I was finally in wedding heaven. Budget weddings that looked stylish and creative.....wedding ideas I could finally relate too. 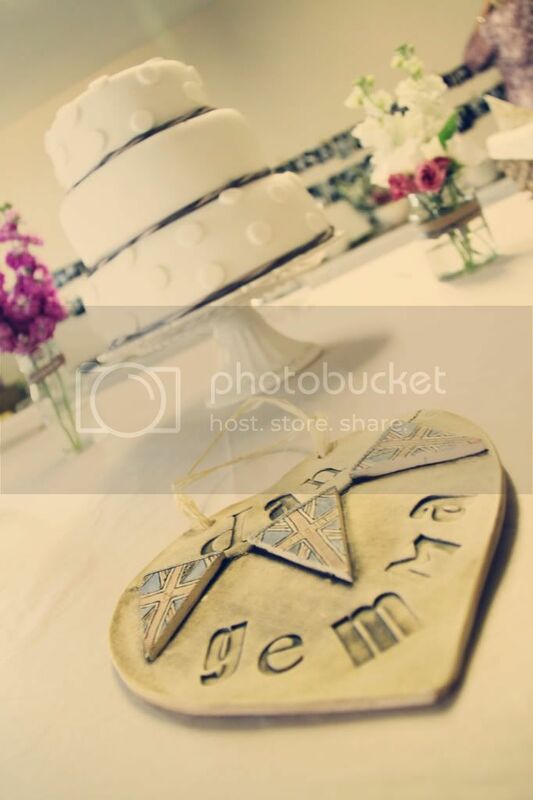 We chose the date 14th of august although our ten year anniversary would be in the april we wanted a summer wedding. The only thing about the wedding I allways knew I wanted was to be married in the church my parents were married in. My mum died in an accident when I was two years old and I felt getting married in the church would be a way to feel like she was there on the day itself, odd thought I know but I liked it. 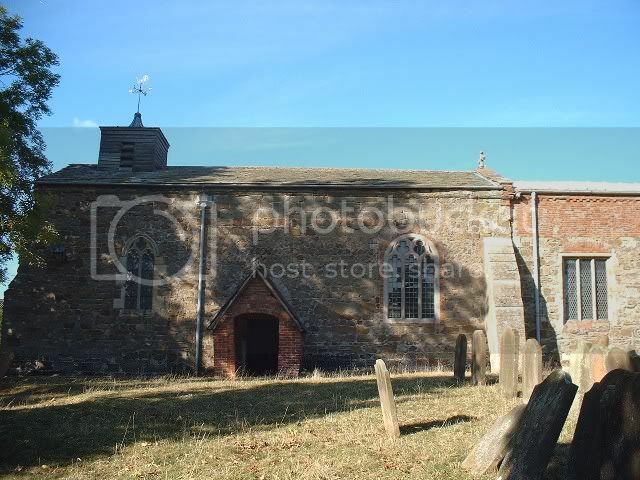 We contacted the warden for the church and he informed us that it would be absolutly fine to marry there he remebered my mum and grandparents that lived next to the church and was delighted we had chosen it as no one had been married there for over ten years. 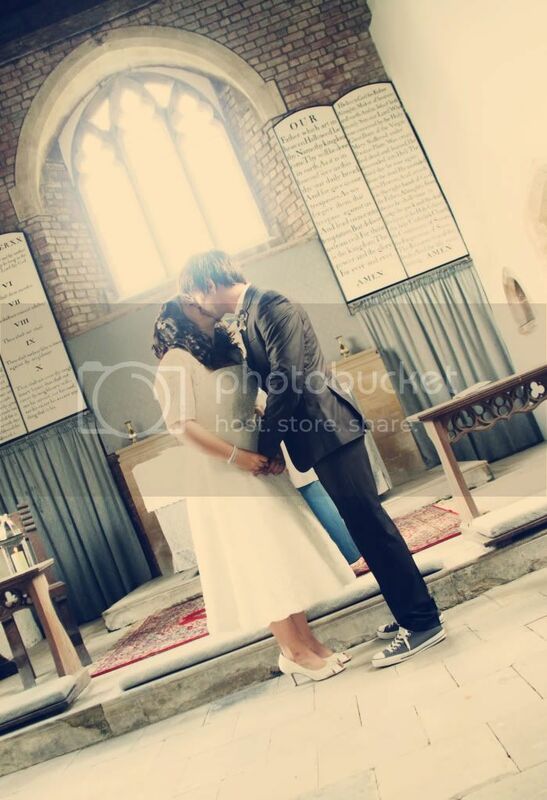 Inside the Church, and our first kiss as husband and wife! So we had our teeny church booked but nothing for our reception, hmmm not really the hotel type when I'm not in uni I work at farm shop on a farm, and ride shire horses for fun, I walk my dog for miles most days and in the summer I like to eat breakfast in the garden, not to mention festivals every year for ten years, being indoors isn't my thing. So we were stumped, until said farm that I work at part time very kindly said we could have it there, well we ddin't ask she offered infact neither of us thought about the farm which belongs to Emma, Dans sister in Laws side of the family. So after checking with her to make sure that was ok and her words being 'of course do whatever you like' those six words sounded amzing, 'do what you like', excellent what could be better a cute garden on a farm with tons of parking and no neighbours for ten miles, Polly an Steve were amzing and we couldn't than them enough. So from there the plans grew, vintage garden party, rustic farm, mini festival...I was seriuosly becoming obsessed with this wedding stuff. Beautiful so far, I love your dress, your photos are amazing too. I can't believe no one has been married at that church for 10 years, it's lovely! So lovely so far...I want to read more!!!! Ahhh!!! More, more please, the pics look amazing can't wait to read on!!! So we had our Church and we had our Reception venue on a farm, and now we faced a ton of questions. Our friends completley understood were we were coming from but alot of the family didn't, they looked at us like we were a little crazy and didn't seem to get that you can do weddings on home turf. We battled for a while trying to explain that it was just the way we wanted it, informal and outdoors and very 'us'. No one was rude about it but we could tell they thought it wasn't going to work. A reaction from my Nan .... 'will we be sat with the pigs' errr no it is a fruit and veg farm there are no pigs! Our next step was to try and lock some things down other than booking the church we needed some important stuff or this wouldn't feel like it was going to happen. We knew the farm had a huge games room seperate from the house which we would use for the bar and food. But we needed a marquee for dancing and a band. 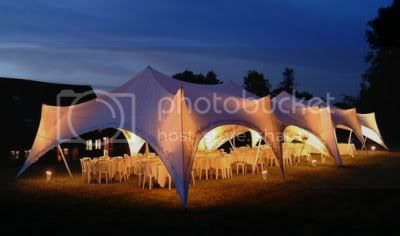 So the marquee was a serious first task and one that I really wanted to give up on until I stubled on this style on a website....the Capri marquee. Perfect exactly what we wanted a marquee that felt like it wasnt a closed room. The first company we spoke to wanted over half a budget for one of these, and I quickly lost hope in fiding one. Much more searching later and an excited telephone call to another company and we got exactly the same as the first guy was renting but for five hundred pounds....bargain and booked. Choosing my bridesmaids was easy peasy I was having four, no questions about it. Natalie - Chief Bridesmaid, she has been my best friend for ten years and she is the most amzing friend a girl could ask for I knew I couldn't ask anyone else. 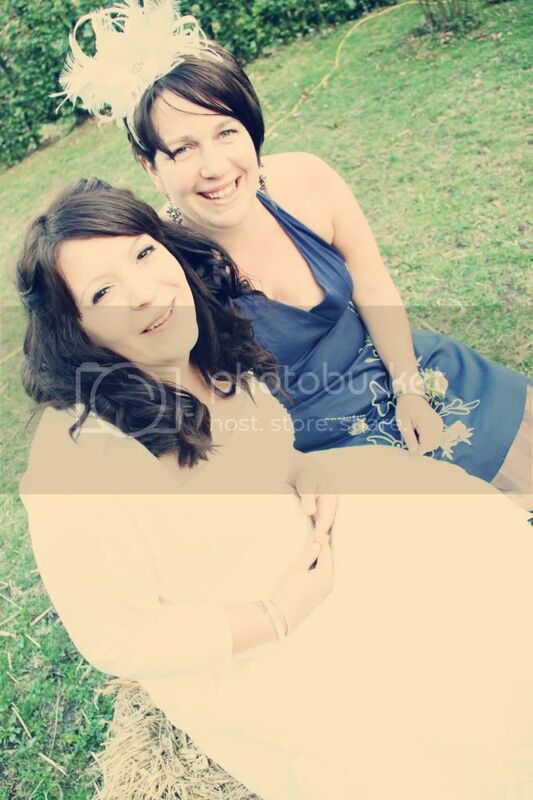 Millie - my sister, a given shes amazing and theres no way she wouldn't be a bridesmaid. Tash - my little sister, funny and ace obviously she was a bridesmaid. Alex - my friend I met eight years ago at college and love her to bits. So I was excited, they were excited....dresses! For a while the dresses were a major issue and not just for budget I didn't want to ask them to pay for their own but didn't have a lot of money either. I didn't want the dresses to scream look at me i'm a bridesmaid and obviuosly wanted them all to look lovely, I was starting to think that they made bridesmaid dresses truly awful so the bride looks better. Taupe, Mink, Cream, perfect they would be the coulours and all non matching! cue strange looks from the family again. 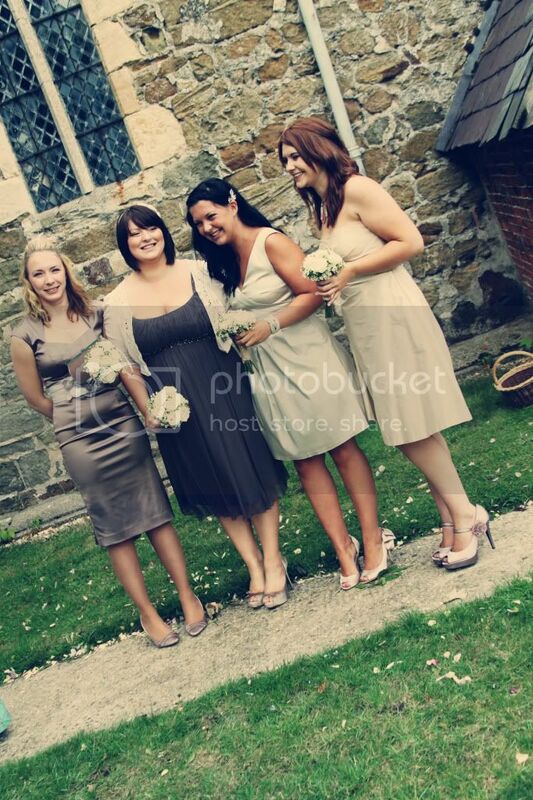 There was no way I was going to try and put them all in the same dress, theyre all so different and as we found out later on my sister Millie was having a baby due three months before the big day. So of we went nine hours in meadowhall later and the girls had got there dresses and we managed to get them all for just under three hundred pounds and they all bought there own pretty shoes. Adam - Best man, dan's cousin. Funny and a trouble maker and this would be the first wedding in family history were these two would actually be allowed to sit near each other. Ronney - Dan's boyfriend as I call him, great firend and had to be a groomsmen. 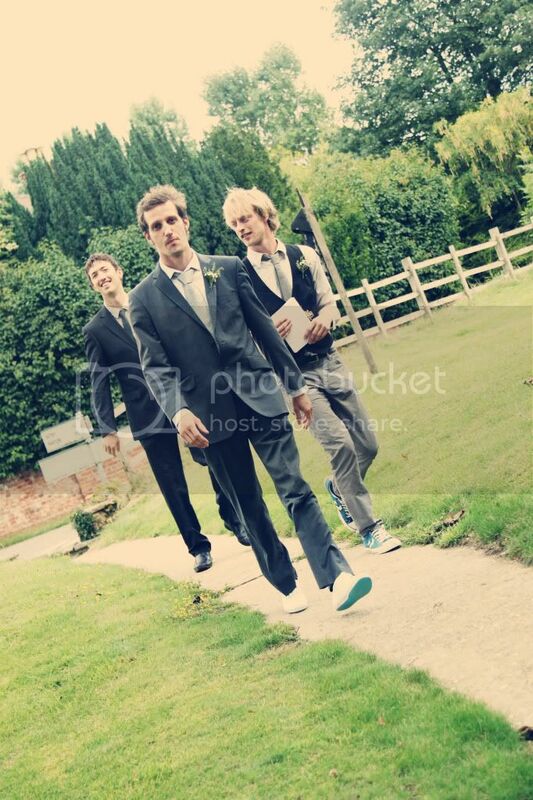 Forgot to mention that the guys all bought bought there own suits and like the bridesmaids didn't match. So back to the planning, well we had set the date and were due to be married a year later now in that year I had to also complete my 2nd year of my degree and plan a wedding for the following summer....I am a sucker for punishment. So with our £3,000 pound budget we knew from the start this would be hugely DIY and my new love of inspiration from the Style me Pretty website and now was seriously in love with details and lots of them. What would a country wedding be without bunting, so I set about making my own and on the cheap, I bought fabric from just about anywere but all in the same colours of taupe and steel and light pink. I cut all the triangle and just sewed the top edge over some twine, I did it all by hand and made over two hundred metres of it...not sure where it was going to go but it would get used. 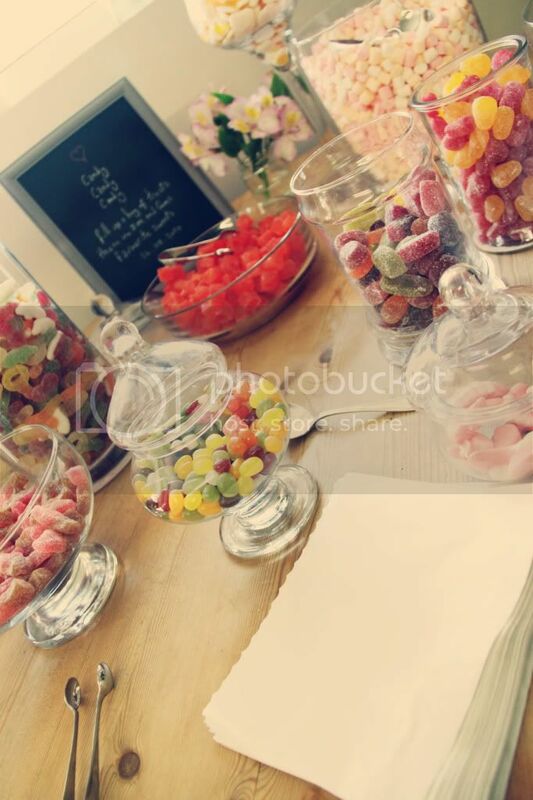 Between uni work we made our invites, order of services and favors of course with our budget everything was going to be DIY and I loved it, and just because we had no money didn't mean we were going to miss out and we couldn't go without a little sweetie bar! I started collecting the jars very early on for this from car boot sales and charity shops, we stored them in our loft for half a year so it was a nice suprise when they came out even though I couldn't remeber buying half of them. And the reason I owe so much to this website, I stumbled on a post on here last year with a photographer offering her services for pennies, I had seen a wedding she had shot that had been featured on rock n roll bride, eeeek and actual fantastic photographer on our budget! Sassy of Assassynation, from our intial contact I knew we were on to a good thing, speaking to her on the phone was like talking to a friend, on the day she was amazing she captured everything that our wedding was about and we are eternally grateful for the photographs. Almost forgot this part, mmmm dresses, not my thing at all and the thought of being dressed like a bride scared me a lot but I was running out of time and needed to start looking. I booked an appointment with a bridal shop near to were I live and took Emma with me (my soon to be sister in law) who had been so amazing during the planning, I had planned to go on my own and was very aware that this was certainly one occassion that would hit me not having my mum there, coupled with my hatred of dresses I just wanted to get it over with. I told Emma this and her words to me were I can't be your mum but I can be your big sister. We were allways close but this wedding has made us the best of friends and now she is officialy my big and best sister. So in we trotted to the dress shop, oh god there all huge! I'll never forget putting the first one on, it was long but not a meringue and fitted well but I didn't feel like me and I was very aware that I was dragging a yard of fabric across the floor. Not good for a wedding reception on a farm. A few more followed, more of the same, I tried to find good things about them and was determined to get it that day and not go through this again. Next thing I know she pulls out Charlotte Blabier's Marilyn, I hesitated but tried it and she gave me a pair of peep toes to try it with, I came out of the changing room swishing the dress and feeling very comfy in it, I like it I admit but I dont like the top part i really hate my arms and have some bad scarring on my right one and this dress just hilights it. The shop lady gave me a little lace bolero to try with it and I loved it, she said she could make the dress strapless and make a shrug in the same lace, winner I felt great in the dress I could move and dance, perfect for a farm, a little bit dirty dancing esq, and made me feel like a nice vintage version of me but not a crazy princess version of me. oh wow, fab! quickly with more! i finish work in 15 mins! Okay so I know I have said about budget already but you all know weddings revolve around it, we didn't have a lot to play with and we wanted everything and didn't want to miss out but most of all it had we had to put our own spin on it, even more of a challenge knowing that most of the people coming really didn't understand our vision for the day. So my page of things to do was four sheets of paper long and no easy task, this was in April, I had just finished my second year at uni with a 2.1, super chuffed and now I could concentrate on only wedding things four four whole months! Dan works with his Dad and is allways busy monday to friday but the wedding plans really were 50/50, it wasn't my wedding at all it was ours and he really loved organising a lot of it. Dan's task....music. Dan studied music, he is in a band (not wedding friendly), his family are all musicians in some way and we have been going to gigs and festivals together every year since I was fifteen, so this was a huge huge part of the day for us. A band, we need a band, there was no way we couldn't have one. Dan spent hours and hours searching the internet for something that was a little diffrent and again on our budget not easy. Until he found 52 Skidoo, a 1920's Harlem swing style band, amazing singer, very authentic and we knew it would be something his side of the family would love and a little more than we wanted to spend but a hell of a lot cheaper than some other bands, the band was actually the most expensive thing we paid for being a little more than the marquee. 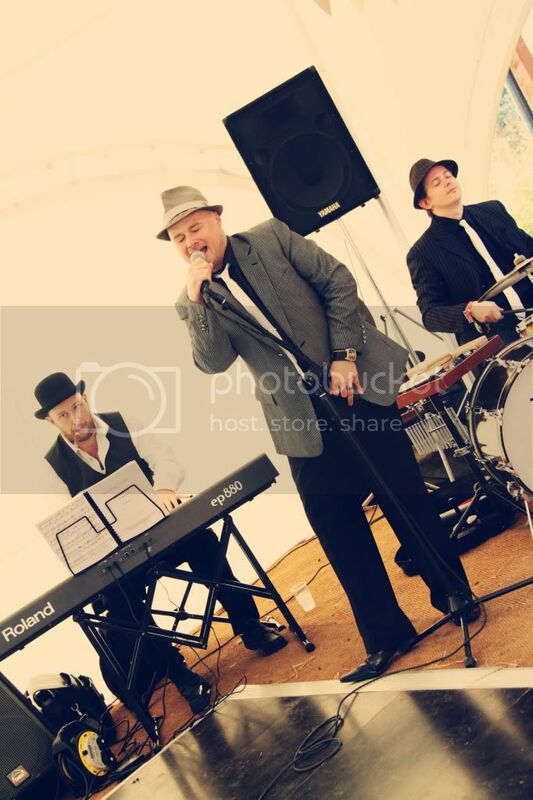 Ok so we loved them, and we hadn't told anyone we had booked them..this was a main suprise of the day. Every now and again I had my doubts, they were expensive for our budget wedding and I wasn't sure people would like them or get up and dance especially our friends (find out later what happens) but we knew just having a disco wouldn't feel right for us. Ahhh disco, yeh hand in hand with dresses as one of the things I don't do. I had been to a wedding the year before where the dj played the most terrible songs and talked over everything in the a cheesey dj way, this was a no no for us it would just not work, Ipod, laptop style somethin it would be then. Dan being in a band had all the pa equipment we would need and we could put together our own playlist for later in the evening what could be better oh and dans dad already had some very professional looking disco lights....music sorted. So the good news was everything was booked and everything else was at least planned to an inch of it's life And I had a huge list of things to make. After getting many quotes from some very expensive hog roast companys one of over half our budget to feed 100 guests we very quickly came up with the idea of having a BBQ, our groomsmens brother is a chef and agreed to cook for us for as long as we needed n return for beer. We knew a guy who owned a lovely butchers in the village I lived in as a kid he is quite well know for his amzing homemade sausages and burgers and he did us a fantastic price on the meat. We had five BBQ's bewteen members of family and a pretty smart looking black gazebo for it all to go in. Salad sorted, all the salad came from the farm and cost us nothing. Desserts would be tons and tons of cakes from waitrose all on vintage cake stands and plates. Evening food would be a huge joint of ham and crusty breads and tons of cheeses and homemade chutney. We decided a wedding cake wasn't important and we would just have all the desserts instead but I made the mistake of telling my heavily pregnant and hormonal sister and I swear I thought she was going to have the baby there and then with the shock. Turns out dan really wanted a wedding cake so we asked a friend of my dads if she would make us something very simple which she did and for free. Well if we were having a cake we were keeping it simple although she kept asking if we wanted butterfly and glitter we gave her a pretty white cakestand and had three tier's one fruit and two victoria sponge with white icing and white polka dots with taupe and steel grey ribbon around the edge. aww, you're photos are gorgeous!! i love it so far, love all the little details and the non-matching dresses look gorgeous! Love it so far, looking forward to seeing more!